There has been a recent spate of law reform (or creation) exercises with a view to adopting modern financial market legal infrastructure. These exercises are a consequence of the aspiration of governments in emerging economies to have capital markets that perform their allocative function efficiently and ensure that assets of companies are efficiently utilised. Although some of these financial market regulatory codes are homegrown, most are constructed externally and transplanted to emerging economies under the auspices of various technical assistance programmes sponsored by multilateral organisations, such as the World Bank and the International Monetary Fund. So long as regulatory codes are constructed that satisfy a prescribed checklist, it is seldom the case that an audit of such codes is carried out, even though most law reform (or creation) exercises are largely unscientific. 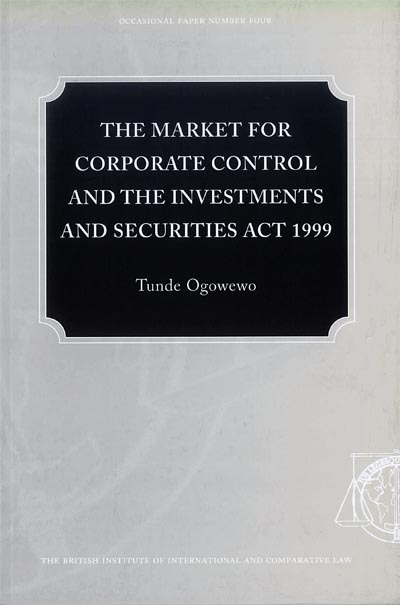 This book is an audit of the result of one such reform exercise, Nigeria's recent capital market statute, the Investments and Securities Act 1999, as it pertains to the market for corporate control. It highlights the pitfalls of law reform (or creation) exercises, even when they are homegrown. It combines exposition and critical analysis of the Investments and Securities Act 1999 with appropriate references to jurisdictions where there is an active market for corporate control. It provides a clear explanation of the legal rules of codes regulating the market for corporate control, enriched by a discussion of the underlying objectives of the rules, and is the first publication to deal with the Investments and Securities Act 1999. Essential reading not only for those involved in constructing codes for emerging markets, but also for practitioners and students of securities regulation.